—American Political Science Association Information Technology and Politics Section Best Book Award, 2014. —International Journal of Press/Politics Best Book Award, 2016, for an outstanding book on media and politics published in the previous ten years. The diffusion and rapid evolution of new communication technologies has reshaped media and politics. But who are the new power players? Written by a leading scholar in the field, The Hybrid Media System is a sweeping and compelling new theory of how political communication now works. Politics is increasingly defined by organizations, groups, and individuals who are best able to blend older and newer media logics, in what Andrew Chadwick terms a hybrid system. Power is wielded by those who create, tap, and steer information flows to suit their goals and in ways that modify, enable, and disable the power of others, across and between a range of older and newer media. Chadwick examines news making in all of its contemporary “professional” and “amateur” forms, parties and election campaigns, activist movements, and government communication. He presents compelling illustrations of the hybrid media system in flow, from American presidential campaigns to WikiLeaks, from live prime ministerial debates to hotly-contested political scandals, from the daily practices of journalists, campaign workers, and bloggers to the struggles of new activist organizations. This wide-ranging book maps the emerging balance of power between older and newer media technologies, genres, norms, behaviors, and organizational forms. Political communication has entered a new era. This book reveals how the clash of older and newer media logics causes chaos and disintegration but also surprising new patterns of order and integration. Also available: Hardcover, EBook, Chinese translation, 2017: Communication University of China Press. “This book is certain to make an important contribution to the field. As such, it is mandatory reading for any scholar of contemporary political communication…. [A] sorely needed, refreshing, and insightful contribution to our understanding of the contemporary media systems in Britain and the United States.“—Catie Snow Bailard, George Washington University, in Political Communication. “The best books are those that provide new ways of mapping complex terrain, enabling new analytical approaches and pointing to pathways out of intellectual dead-ends. Andrew Chadwick’s The Hybrid Media System promises to be such a book…. illuminating, reorienting, even analytically liberating.“—Regina G. Lawrence, University of Texas at Austin, in Political Science Quarterly. “Andrew Chadwick’s book The Hybrid Media System offers something important and rare: an empirically grounded and theoretically rich account of how and why the assumptions that have historically guided journalism studies and political communication are insufficient for explaining contemporary media… dizzyingly multidimensional… The assemblages of journalists, technologies, and political actors Chadwick traces offer compelling evidence for the Hybrid Media System and many starting points for future study.”—Mike Ananny, University of Southern California, in Journalism. ”[A] self-assured feast of hybrid thinking, which renders simple dichotomies relating to politics and media obsolete…. [and] combines highly detailed accounts of interesting and stimulating cases, based on varying methods, with elegant and informed efforts at theorizing…. Chadwick… diverges from simple conceptual distinctions between ‘new’ and ‘old’ and simple normative evaluations in terms of ‘threats’ to or ‘chances’ for democracy. Rather, he demonstrates how different types of media find a way of working together and how volunteers, pressure groups, and amateurs fight their way into political issues. Conversely, he also describes how the political and media powers-that-be restrategize in the evolving political-media landscape. Chadwick provides great insights, a highly enjoyable reading experience, and excellent research approaches.“—Thomas Schillemans, Utrecht University, in Public Administration. “The case studies are perhaps the book’s most impressive and significant contribution…. Chadwick’s microanalyses of these news events illustrate that this kind of granularity is, ironically, now essential for understanding the more macrolevel, systemic interactions and interdependencies that are the focus of the book, given that we now live in a time when an individual tweet can set off a complex, multidirectional chain reaction within the larger media ecosystem, as well as within the political system that this media ecosystem monitors. Uncovering these dynamics requires extensive digging for, and sequencing of, different types of content across multiple platforms and effectively mapping their flows and impacts across these platforms. Chadwick’s comprehensive dissection of these processes does much to illustrate his larger points about the increasing interconnectivity of media platforms and the migration of specific norms and behavioral patterns across platforms… Chadwick’s measured analytical approach is one of the book’s great strengths.”—Philip M. Napoli, Rutgers University, in The International Journal of Press/Politics. “Chadwick approaches media with considerable theoretical nuance and a rigorously empirical sensibility. Most importantly, the book directly and accessibly addresses a set of questions that have significant implications across sociology, political science, and media and communication research—as well as outside the academy—concerning how power, citizenship, and democracy work in hybrid media environments…. [A]n exemplar of what empirical work on our contemporary media and political environment might look like and… a major contribution to advancing our understanding of media and politics.“—Daniel Kreiss, University of North Carolina-Chapel Hill and Rasmus Kleis Nielsen, Oxford University, in Social Forces. “The lesson from Andrew Chadwick’s The Hybrid Media System is both simple and profound: we are all hybrids now… This is an important and timely book… will likely one day be measured by the weight of future scholarship that it inspires.”—David Karpf, George Washington University, in Information Polity. “In The Hybrid Media System, Chadwick’s primary aim is to peel away the misbegotten dichotomies shaping so many current debates surrounding contemporary political communication and to present alternative frameworks that go beyond those dichotomies. In that aim, he is extraordinarily successful.”—Matthew Powers, University of Washington, in Media, Culture, & Society. “Big theory for understanding a complex political media environment… There is a context and depth to his theoretical contribution that is often absent in related literature… [w]e highly recommend this book to any scholar interested in the modern media environment and how it is shaping political power.“—Jason Gainous, University of Louisville, and Kevin Wagner, Florida Atlantic University, in The Journal of Politics. "valuable, thought-provoking, and conceptually-compelling. "—Steven Livingston, George Washington University, in Perspectives on Politics. "Chadwick pulls back the curtain, revealing that old and new media actors are interacting to make news…. Overall, Chadwick shows the reader that the neat boundaries once separating newspapers, broadcast, and telecommunications are not disappearing but are rather merging into a hybrid system. Throughout the text, his implications for professional media organizations and political elites are obvious: adapt to new media or fail. "—Terri L. Towner, Oakland University, in Social Science Computer Review. "Having read this, many textbooks feel dated to me now. This volume describes the organization, logic, and function of contemporary media in immediate and engaging terms. It is a must read for all students of media, and interested parties in general. "—Zizi Papacharissi, University of Illinois Chicago, on Roy Christopher’s Summer Reading List blog post. "Concludendo, quanto teorizzato in The Hybrid Media System può essere tranquillamente considerato uno dei principali strumenti teorico-analitici attraverso i quali decifrare al meglio… la comunicazione politica contemporanea.”—Diego Ceccobelli, Scuola Normale Superiore (Pisa), in Comunicazione Politica. "For media and political actors, the past decade has been a time of proliferating ‘disruptive’ digital communications, ‘a chaotic transition period’ in which ‘complex and multifaceted forces [are] reshaping the political communication environments of the western democracies.’ In the beginning, their responses were scrambling and ad hoc, presenting openings to nontraditional actors, such as bloggers, for instance. But over time, older power dynamics have adapted and traditional power holders have regrouped and reasserted themselves under the new conditions… a careful and detailed analysis. "—Jonathan Sullivan, University of Nottingham, in the Taiwan Journal of Democracy. Read the full 17-page review article of mine, John Keane’s, and Stuart Soroka’s latest books here. "Chadwick performs a service in signalling the interaction between new and old media that clearly characterises contemporary political communication and illustrates his point in a detailed and convincing manner. "—European Journal of Communication. 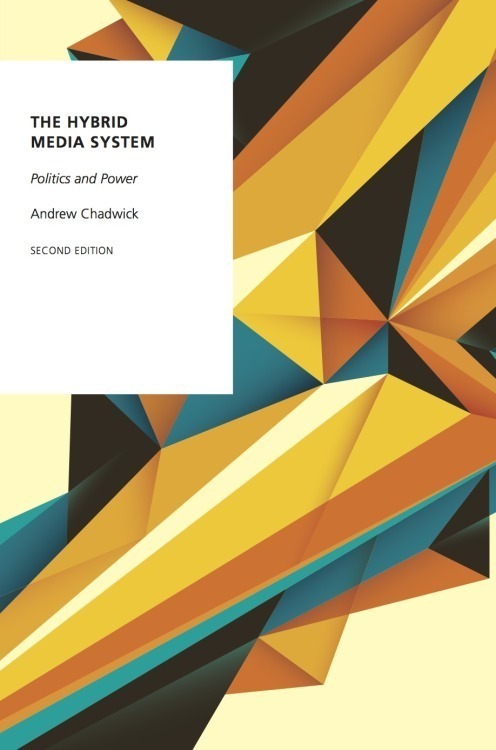 "Chadwick provides a compelling analysis of the complexity of hybrid media systems where political life is mediated through the web of networked actions involving offline and online communications as well as grassroots activism…. The book is a valuable contribution to the debates on the rupture caused by digital technologies. "—Taberez Ahmed Neyazi, Jamia Millia Islamia University, New Delhi, in Political Studies Review. "This is an important book, already cited as seminal in the field of political communication. "—Laura Roselle, Elon University, in Choice. — Booksite and blog. A place to gather together materials that illustrate and in some cases extend the themes and issues covered in the book.